What a day with @Mike Pow, had to “unlearn” some stuff and then slowly build-up again. So glad to have met Mike, now enough to think about and improve over the next 10 days. Top man! Was my absolute pleasure to meet and ski with you. 8 days in Japan, 8 consecutive days off heavy snowing... It's ridiculous. My one and only trip we were getting twitchy when it hadn't snowed for 24 hours....but then it started and never stopped! Buzzing that I've just negotiated a two week trip for xmas/new year 18/19. Long may the dumping continue! Gonna hire a car and spend a week in Niseko and a week in Otaru. Didn't manage to get to Moiwa, Rusutsu, Teine or Kokusai last time so they're all on the list. Would love to hear any reports. Please keep the stoke coming! Massive news! Looks like Kiroro has opened most of its area as officially sanctioned in bounds off piste, without the need to register or submit climbing plans. One of the great things about Kiroro was that you could have multiple powder laps all day, now it will be trashed. @sqmaleb, Top work that man. At Kiroro it's not the chair you can see that gets you, its the one coming the other way. @element, @PowderAdict, It looks like the main lift accessed off-piste area (the central valley that you can access from the top of the Nagamine or Asari side) is still "out of bounds" going by the map. Same with all the other parts for which you need to exit the resort boundary. Hopefully they are still going to allow people to cross the ski area boundary in addition to these new officially allowed off-piste areas inside the resort. Areas 1, 3 and 4 on the map (Powder Ridge / Orange Light / Peaches) were my favourite for inbounds, but you could already enter them without crossing ropes and loads of people did, so I doubt the new rules will make much difference to how tracked it gets. Not sure about the other areas - maybe I missed out on some good bits! I'll try an keep a daily log of the resorts and conditions. Day 1 : I flew out a couple of days earlier than the rest of the group, so skiing nominally alone. My hotel is 5 mins walk from the Kitanomine lift, so easy access. Forecast was 50% chance of snow, and cold. The cold they got right as it was -8 to -10C, and fortunately we got the 50% snow, as it snowed nearly all day. You know its dumping when snow builds up on your skis when you're on the chair lift . The resort is very quiet with the majority of skiers made up of school age beginners and the Army in regulation boots and telemark skis. I was surprised at the conditions as there was plenty of deep un-tracked powder, with faceshots on demand. Standout areas were the hike-able peak off the top of the Kitanomine gondola, the face above the top station of the Ropeway lift, and the Diamond Cut area off the top chair on the Furano side. All had waist deep powder in places, and fresh lines. There was a crust layer about 30cm down on southern faces of the Diamond Cut, so I guess there must have been a warm sunny spell in the last week. I skied most of the day with an American I met, which gave both of us more options, as most of the areas are out of bounds, and its safer as a pair. @musehead, I hope you are right, as I'll be there in a week. I'm sure that @MikePow will be along to confirm the situation. @musehead, yeah, I hadn't thought about the boundary crossing issue but hopefully that stays the same. We had tried to enter areas 1,3,4 in Jan last year but a ski patroller rushed over and frowned/head shook us off it. There were no other tracks so he was obviously policing it. Next to all the anti off piste signage it left a bit of a bad taste, as much as I loved the place. I don't like to go to another country and be disrespectful, especially given how well we were treated in general. I like the consistency of this new policy. It shows all the backcountry gates so it looks like the system is still the same for anyone wanting to leave the resort boundary. @element, Must have been inconsistent as we and many others had no bother doing the same (without ducking any ropes) on a couple of days in Jan last year! You're a dickhead for ducking the rope and skiing under the Asari double chair. Kiroro is the only resort which has official permission to lease, open and manage the terrain between the pisted runs which falls within the resort boundary. It's taken until 16 February to unveil the signage and the Off-Piste Map because the wheels of change run very slowly in Japan. The Off-Piste areas will remain open this season for as long as they are deemed safe, and will re-open for the 2018/19 season as and when conditions allow. Each Off-Piste area has a marked entrance point with a diagram of the area and relevant safety instructions. Access to the backcountry beyond the resort area boundary is still through the various exit gates. To exit through the gates you have to complete a climbing plan in the Mountain Club. @Mike Pow, Thank you, a concise explanation. Day 2 : Furano. The forecasts looked good, with light snow in the morning, and heavier in the afternoon. 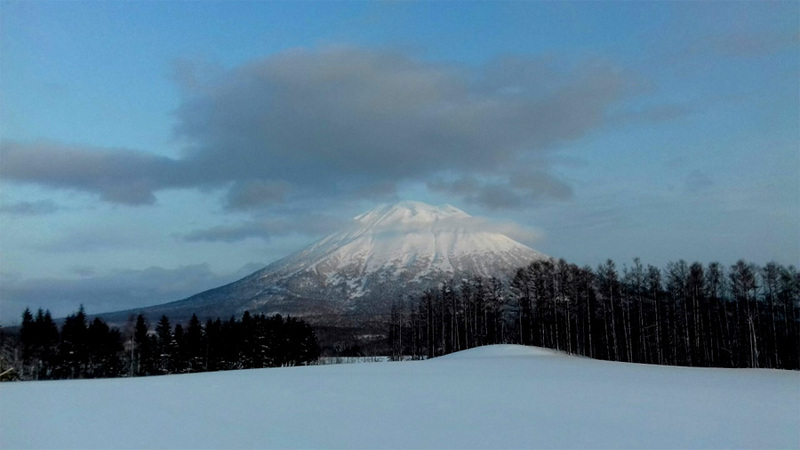 What wasn't forecast were the strong winds, which shut the Katanomine gondola all day, and the wonderfully named top chair on the Furano side "Downhill Romance No.3". Since these 2 lifts grant access to the best powder regions, it wasn't looking good. After an excellent first day, I'd brought out my extra fat skis, which was starting to look like a mistake. However, there was still enough powder in the trees to make them worthwhile. Being a Saturday I expected more people, but I guess they used a better forecast than me. Even so there was double the number of people, but the numbers quickly reduced as many were frozen off the the mountain. The "Downhill Romance No.3" chair looked like it was being prepared for opening as I gave up early (there was a hopeful queue forming), but it might just have been to get Ski Patrollers up the mountain to check the conditions. Cheers Mike, any idea what form that might take ? Maybe just stupid and can’t read? Mountain Club is on the second floor of the Mountain Center. You fill out a form with name, contact details, number in group that type of thing. Indicate on a map the areas you intend skiing. You then receive a ticket which you show to the person at the exit gate. Day 3 : Furano. The official start of my Whiteroom tour. A bluebird day, but unusually no new snow overnight. Although cold, dropping to -13C by the afternoon, the lack of humidity, made it feel warmer in the sunshine. There was no need for the usual first day ski assessment, as the rest of my group are all Norwegians who have been skiing since they could walk. Since there was little new snow the priority was to hit the zones which had been restricted yesterday due to lift closure, which were the Diamond Cut off the top Furano chair, and the Premium Powder Zone of the top of the Kitanomine gondola. Both had reasonable powder, the Premium Powder Zone partially at least living up to its name. Incidents of note. One wallet left in restaurant at lunchtime, found in exactly the same spot 4 hours later. One go-pro smashed out of its housing by a tree, found after 15 mins, so another result. Furano, amazing snow but very long exit flat no? I struggled with the short verticals in JP. Niseko was the exception but suffered from Verbier like powder frenzy! Some longer lines in the side & backcountry, and some resorts like Sapporo Kokusai and Sapporo Teine have consistent pitch vertical but overall it's short laps with consistent snow top to bottom in Japan. Agree with that, though already planning on returning next year but only for touring trip with possibly an end of week well earned cat excursion. We managed 1,000m up Mount Yotei and there's still another nigh on 600m to do and as you can see some steep terrain! There are many other good steepish decents but you have to earn those turns. Yesterday I had a classic La Grave day (see La Grave thread) and that was on a par with any Japanese experience, but it is a different sort of skiing. It's the consistency of the snow in Japan that makes it so attractive plus by going off the grid a little you can have more of an authentic trip. @BobinCH, At Furano, only the Diamond Cut area off the top chair has the mega exit traverse ending the side step up the dam, practically everything else exits onto a piste. I've done the traverse many times on my Spoons, which could torture late in the afternoon when it has become a bobsleigh run. The Lotus 124's proved way better for that traverse. Day 4 : Kamui. With no significant snow for 24 plus hours, and being a Monday after a heavy weekends skiing, Kamui was much as expected. As is usual at Kamui all the best skiing is out of the top gates and round the left/right outside of the resort, returning at the bottom lifts. We found plenty of 'heavy powder' lines, but which I mean powder you would be perfectly happy to find in a European resort, but heavy for Japan. There were also a huge number of tree bombs, which made the skiing more exciting, as they don't break when you hit them. The weather started sunny and -9C, but wind built up during the day to the point where it briefly stopped the main gondola. It was snowing as we left Kamui, and for most of the way back to Furano, so we are hoping it dumps overnight. If you're coming to Hokkaido for lift accessed steeps then you're doing it wrong. @Mike Pow, Cheers for the info. I'm planning to pack skins so maybe do some touring too, or at least be able to access more out of the way stuff. Lots of easily accessible sidecountry / backcountry from the resorts. Inbounds terrain in the Hakuba Valley is very similar to the Hokkaido resorts. The terrain above the resorts is epic. And alpine. The terrain skier's left and below the gondola station at Kurodake is very good. Drops you down to the river and dam and it's a short skate / pole back to the gondola base station. Terrain above the double chair is as wild as you want. Day 5 : Sahoro. The day started sunny, and when we arrived before 09:00 it was -9C. I can’t tell much about the resort in general, other than is was very quiet, as we only rode two lifts, the main gondola and the new’ish quad chair which runs on the other side of the peak, and didn’t ski any of the front side pistes. This new chair serves the resort expansion area of Red/Black runs, and loads of tree skiing. We lapped this multiple times, and found fresh tracks the further left we went. Day 6 : Furano. Why drive for an hour, when you have powder at ‘home’. When we went to bed it was snowing, and the basic rule here is whatever falls in town, is only a third of what falls on the mountain. So with 15-20cm in town expectations were high for a epic day. It was cold at -14C, but the air is so dry it doesn’t feel like it. The resort was practically empty of fat skis, so nothing was being tracked out off piste. The snow was light and pretty much all evidence of previous tracks had been removed, so we had our choice of fresh lines all day. Got back from Honshu at the weekend, had a fantastic trip and the whole group are still buzzing. The travel time means the first couple of days merge into one. But they consisted of driving to Manchester Airport, flying to Helsinki, flying to Narita Airport, train to Tokyo, bullet train to Nagano and a bus to Hakuba where we met the guide who got us in his minivan to the hotel. We hit every connection spot on and only had time for a beer/hotdog at Helsinki airport and a quick Soba at Nagano train/bus station along the way. Day 1. Tsugaike-Kogen in Hakuba. It had snowed for a couple of days before we arrived, and overnight, and had stayed cold. We went straight to the top of the resort through the gates and into the woods and lapped similar areas all day. Only a little tracked and fresh lines were easy enough to find. We were happy bunnies. Day 2. Cortina in Hakuba. It hadn't snowed since the previous night, but it was still cold. To get into something fresh we went on a bit of a ski/walk/ski/walk day ending up at a hydro electric plant a couple of valleys away from the resort. We had a bit of everything; trees, glades, combat. Picked up in the minivan at the bottom. Day 3. Kashimayari in Hakuba. Still no new snow, but remaining cold so it was good when you found it. This was a bit of a gem; off the top lifts and through the trees and down to the road. 15/20 mins hike back to the lifts. Lapped it all day, but in slightly different ways so got new snow all the time. Day 4. Road trip to Myoko. No new snow, so a bigger tour up Mount Kashimayari. Epic. Three/four hours up and a totally untracked descent in soft deep snow on a bluebird day. Probably my best day ever on a pair of skis. Day 5. Culture day. Road trip. Storm meant to be coming in the next day; rain lower at first but turning to snow after midday, so we thought we'd go on a long sightsee. Nibbled on crickets and wasabi cheese in the van washed down with a local beer. Classic Japanese meal for lunch with a selection of saki, Matsumoto castle and a Yakitori restaurant to finish. Day 6. Back to Hakuba by mid morning. Still raining by lunchtime and people coming off the hill were reporting crap conditions. Decided to extend our culture day to include Hakuba brewery and pub as there was live music on. Day 7. Snowing, but windy. Went back to Tsugaike to find trees for shelter. Top lifts closed. Lapped lower, in bounds, trees and made the best of it. Not bad considering the whole resort was trying to do the same. Day 8. Big powder day. Still coming down. Decided on Hakuba 47 because you have to register (and sit a test) to get a bib which lets you get into the backcountry. On a powder day people can't be bothered, so we though it would keep the fresh, well fresh! It did. It was deep. It was a bucket load of fun. We were laughing at the snow as we went. Day 9. Stopped snowing and warmed up overnight. Went to look at a few lines out of Hakuba-Goryu. Next door to 47. It couldn't have been more different to the day before; it was like being in Europe; heavy, cut up and hot. Stopped early to pack up and head to Tokyo for more culture. Enjoyed it more than Neiseko eight years ago, even though the snow was better up north.